In 1977, Professor Wangari Maathai founded the Green Belt Movement in Kenya. Since then, the movement has planted more than 30 million trees throughout Africa. In 2004, she was awarded the Nobel Peace Prize for her contribution to sustainable development. Professor Maathai was a keynote speaker at the opening of the UN International Year of the Forests where she implored decision-makers to stop taking for granted the environmental services that trees provide. Read the transcript or listen to the audio file below. As a UN Messenger of Peace for environment and climate change, and an advocate for the MDG’s, it is a privilege to share this forum with your Excellencies. As we all know, our human history and civilizations have always been intertwined with trees and forests: the way we use them, relate to them, protect and conserve them, and the way they enhance our spiritual, cultural and social well being. The call to protect them has been long and consistent with the most recent being at the UN Conference on Biodiversity in Nagoya, Japan and at Cancun, Mexico on climate change regulation. We are all familiar with the importance of forests because they are the bedrock of biodiversity and habitats and provide so many environmental services. Then there is the link between peace and forests. Though not always obvious, without good governance and equitable distribution of resources like forests, trees and water, it is impossible to permanently preempt conflicts and wars which are fuelled by competition over vastly diminishing resources. Governments and the communities they serve know they cannot improve the quality of life and maintain peace without managing natural resources sustainably, responsibly and accountably, and ensure they are shared equitably. Yet it continues to be difficult to galvanize the political will of all governments to embrace the, policies and programs that prevent deforestation, forest degradation, and destruction of biodiversity and habitats. Why? There is a contradiction here. And that is that many forest-dependent communities that live in resource-rich forests are poverty-stricken. There is something inherently wrong and unjust with a global economic system that tolerates dehumanizing poverty in regions that are so resource rich. Why are our leaders so slow to embrace solutions that could deal with such inequalities and injustices? As a Goodwill Ambassador of the Congo Forest ecosystem, I thank the British and the Norwegian Governments that supported the creation of the Congo Basin Forest Fund based in the African Development Bank. But it has been very difficult to get more partners to join the fund. Without adequate international support for such efforts, it’s very painful to see forests degrade, disappear and threaten the livelihoods of especially indigenous and forest-dependent people. It is even more unfair to force the future generations to inherit such a legacy. …We are encouraged by the report that there is a decline in the deforestation of the world’s great tropical rainforest of [Congo, Amazon and Mekong Basins]…where there is a political will, commitment , transparency and accountability, there will always be a way to find financial support. We are all working hard to realize the Millennium Development Goals, especially eradication of poverty. My experience with the Green Belt Movement and the women at the grass roots level is that it is actually impossible to recognize many of the other MDGs if #7 MDG—on sustainability—is only given lip service. Sustainability of resources like water, trees and forests is the mother of all other MDGs. Where governments ignore sustainability, they are also only giving lip service to the other MDGs and it shows. We know that generating national revenue and improving the quality of life of citizens is often the reason governments tolerate destructive activities like logging, charcoal burning, human settlement, and agricultural activities at the expense of forests and biodiversity. But this often only exacerbates the financial and economic challenges the same nations face when they are later confronted by floods and landslides, dried-up river beds and lakes and water taps, crop failure, starvation, death of humans and wildlife—and the embarrassment of begging for international aid. In such instances, it is because there is failure to recognize the relationship between our human activities and the many disasters that follow. That failure is the reason we are here: to continue repeating and encouraging each other to appreciate that, contrary to many mythologies, the Gods are not at fault. They are not to blame. Many of these disasters are man-made and preventable. It is not that we do not know. None of us can claim ignorance. We know what to do. Much information is out there in the offices and libraries and they are constantly being reviewed in seminars and meetings. Although many governments, communities, companies, cities and even individuals are doing their part at their levels, there is the need to intensify global partnership because these threats are real, and they are global. For example, we take for granted the environmental services that trees provide, especially when they are standing in remote, poor parts of the world. They are taken for granted, and treated as unlimited. But they are finite. Therefore we need to bring into our dialogues an accounting system of their true value and be willing to pay. As we negotiate and make accommodations and agreements that is needed to find a balance between the immediate needs of communities and the common good of all who depend on forests that are sometimes long distances from where they live. Governments have a responsibility to ensure that the ecological services provided by trees and forests are available for the common good for all communities, including future generations. 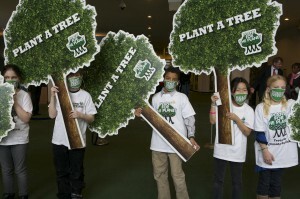 …May we have a very successful United Nations International Year of Forests 2011.